The "Project Management" allows users to easily manage projects including input files and results from all tasks of the Genomatix Software Suite. The project management page can be accessed by selecting "Projects & Accounts -> Projects & Results" from the top menu of each page. Additionally, users of Internet Explorer need at least version IE9. Projects and results are presented in a master-detail view. Projects are listed in the left panel. 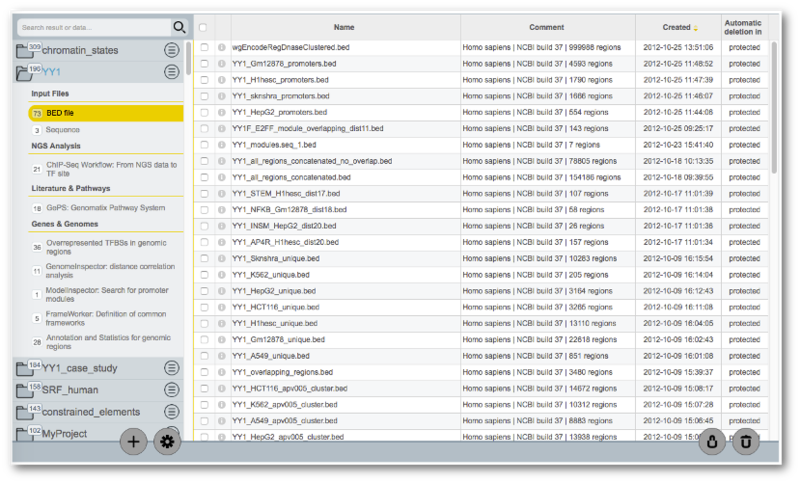 Expanding a project by clicking on its name will show an overview of the associated input files (BAM, BigBed, VCF etc.) and available results for the various Genomatix tasks. The number of available files/results of each type are given in a small box on the left. Selecting a type of input or a task with results on the left side will display all available files or results in the table on the right side. Double-clicking a file or result will open it, whereas a single click will select the file for further actions (see below). Note: If an input file appears in red, the file might not be available (for reasons see below, special treatment of BAM files). The application stays responsive, i.e. even while it is loading some information due to a user interaction, further interactions are still possible. Note: There is always one default project called MyProject which cannot be deleted or renamed. Clicking on a project expands the project to display all tasks for which input or results were created. Click on the desired task to load the results into the table on the right. Double-clicking on an input file or result name within the table will directly open the input/result. The button on the lower left side opens a dialog where a new project name can be entered. The new project will be disabled until creation on the server is complete. The new project will appear in the column on the left. Clicking on the button to the right of each project's name displays its comment, creation date and size. Note: The project's info view has to be open in order to do the following project actions. To edit the project's name, use the button to switch to edit mode. Hit "Enter" or the button to save and "ESC" or the button to cancel any changes. To edit the project's comment, use the button to switch to edit mode. Delete the complete project by clicking on the button at the bottom of the info view. A confirmation dialog will be displayed prior to deletion. 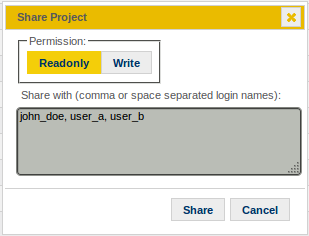 Note: The 'edit name', 'edit comment' and 'delete project' actions are not available for the default project. You can archive a project by clicking on the button at the bottom of the info view. A dialog asking for an email address where the archive will be sent to will be shown. To share a project and its results click the button at the bottom of the info view. In the upcoming dialog, you can select the permissions for the receiving user(s): 'readonly' or 'write'. By having 'write' permission, every action is allowed except moving and copying. Specify the receiving users, by inserting their login names into the text field in comma or blank separated form. After sharing a project, a new section 'shared with' will appear in the projects info. Received shared projects will be shown at the bottom of the project list, under the section 'shared projects'. The section 'shared with' lists all users the project is shared with. Clicking on one of the users allowes to revoke the project from that specific user. Different colors are used to indicate the permission the project was shared with. You can also revoke the shared project from all users. For that, simply click the button at the bottom of the info view. which will be in place of the button. Note: Settings will only be saved across sessions if your browser supports 'localStorage'. To alter the behaviour of the project list, click the button which opens a dialog showing the current settings. You can change how projects are sorted and whether it should be possible to expand multiple or only a single project. Searching for results in all projects can be done by entering a result name in the search bar on top of the project list and hitting 'Enter' or clicking the button. The result view on the right will list all search results after the search is complete and if any results were found. Clicking a row in the search result view will return to the result view and select the selected result. You may also directly display the result from the search result view, by double-clicking the result to be shown. The row will switch to edit mode, allowing you to edit the result's name and/or comment. To confirm edits either click anywhere outside the edited row or press 'Enter' while the result name input has focus. Cancel the edits by pressing 'ESC'. Results are moved by simply dragging the result and dropping it on the desired project in the project list. On drop, a dialog will ask whether the result should be moved or copied. Multiple results can be dragged by selecting them via the checkbox and then dragging one of the selected results. Select the result to be deleted by clicking on it or use the checkboxes to mark multiple results. Press the button on the bottom right corner to delete all selected results. Select the result to be protected by clicking on it or use the checkboxes to mark multiple results. Press the button on the bottom right corner to protect all selected results. Double-clicking a result opens a new tab/window with the result page. Clicking on the button will expand the row, showing a result's size. Click on the desired column header in the result view table to use that column for sorting. A second click will switch the sort order (descending/ascending). If any new results become available the page will automatically update, and the results will be added to the view. In addition, a notification popup will be displayed in the upper right corner when a new result becomes available. Note: Unfortunately this feature won't work in any version of the Internet Explorer. Supported browsers are: Chrome 6.0+, Firefox 6.0+, Safari 5.0+, Opera 11.5+. Users of Internet Explorer need to reload the page manually to see any new results. BAM files can be very(!) large. Therefore, when importing them via the 'GMS' or 'GGA' option of the BAM file upload dialog, only meta information will be stored in the Project Management, e.g. the path to the original BAM file, but the files won't be copied to the Project Management. Each GGA tool/program that accepts BAM files as input will fetch the BAM data directly from the original BAM file location. If you delete the original BAM file on the GMS or the GGA, then it will not be available for the GGA tools/programs any longer. On the other hand, the original BAM file won't be changed when you delete the corresponding BAM file entry in the Project Management! The BAM file import via the 'local' option works just like the BED file import, i.e. the BAM file itself will be stored in the Project Management.